Interested in learning more about Wabanaki art and designs? 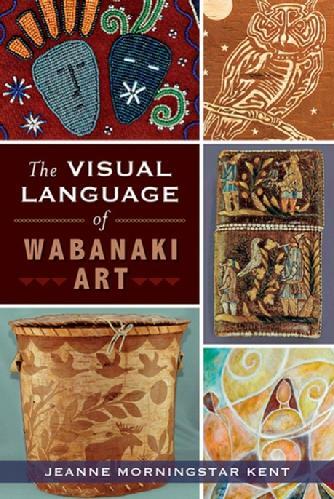 This 144 page book "The Visual Language of Wabanaki Art" includes 50 images, and is a great resource. I am featured in a chapter of this book , along with color photos of my work. I have copies available for sale, see below..
For centuries, the people of the Wabanaki Nations of the northeastern United States and eastern Canada used signs, symbols and designs to communicate with one another. As Native Peoples became victims of European expansion, the Wabanaki were separated by war, the search for work and intermarriage, as well as by hiding their identities to avoid persecution. In this diaspora, their visual language helped them keep their teachings and culture alive. Their designs have evolved over time and taken on different meanings, and they are now used on objects that are considered art. While their beauty is undeniable, these pieces cannot be fully appreciated without understanding their context. Tribal member Jeanne Morningstar Kent sheds light on this language, from the work of ancient Wabanaki to today’s artists—like David Moses Bridges, Donna Sanipass and Jennifer Neptune—once again using their medium to connect with their fellow Wabanaki. This is the story of Painted Shell, a young Abenaki girl. Although she is named for a certain type of turtle, she asks the question "What then is a turtle"? Living on a mountaintop where there are no turtles, all of her extended family come together to show her just what a turtle is. Written by Abenaki Grandmother Susan Rising Song, this tale incorporates traditional values of respect and compassion for others, along with descriptions of life in an Abenaki community long ago. Monica Alexander, of Mi'kmaq descent, has created illustrations that are not only beautiful, but historically accurate and culturally relevant. Birch bark containers, quillwork, mountains, valleys and of course, turtles decorate these pages.